MORE 2019 MCYCA EVENTS YOU WON'T WANT TO MISS!!! COMING SOON! If you have a question check out our "FQA" page!! We welcome you to an exciting cheer league serving Mentor and it's neighboring communities. For over a decade Mentor Cardinal Youth Cheerleading Association (formerly known as Mentor Youth Cheerleading Association) has provided instruction on the fundamentals of cheerleading, while putting an emphasis on teamwork and fun. The MCYCA cheers for the Mentor Cardinal Youth Football Association (MCYFA). MCYCA runs in association with the MCYFA and follow the MCYFA game schedule. MCYCA cheer practices commence in late July and the football games begin in August. We will post a schedule before the season starts. The MCYCA board and coaches are looking forward to a great 2019 season!!!! Join MCYCA and enjoy great league events such as: uniform try-on, cheer clinic, 4th of July parade, youth night at MHS, and end of the year party. 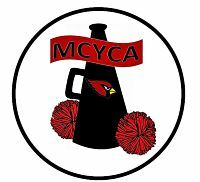 MYCA merged with Cardinal cheer to keep in line with the MYFA merged with Cardinal football to form a new league. Both leagues decided that it was in the best interest of the youth athletes in both leagues to be together which will positively impact the game of football/cheerleading in the city of Mentor. Will we travel to other cities for games? Yes, the MCYFA/MCYCA is now part of the GLYFL. The GLYFL has 10 clubs that all have multiple teams. They consist of Willoughby, Willowick, Chardon, Riverside, Mentor, Eastlake, Wickliffe, Perry, Orange, and Kirtland. All have fields that we may travel to with the exception of Orange who will always play away games. The registration cost is $55. YES! This year we will offer a $10 discount for both siblings of cheerleaders and football players. If you have a child who will be playing football for MCYFA or they have a sibling who will be cheering, please contact us by email BEFORE you register your cheerleader to receive the discount. Will we need to purchase a new uniform this year? NO, we will be keeping the same uniform as last year. ALL NEW CHEERLEADERS ARE REQUIRED TO PRUCHASE A NEW UNIFORM PACKAGE. The package is $65 and will include a skirt, top, spanks, pom-poms, socks, and bow. Is there anything besides the uniform package that my cheerleader will need? Yes, your cheerleader will need white tennis shoes, white long sleeve shirt (sport/performance type recommended), and black leggings. Will there be any opportunities for my child to try on a uniform before we register? If my child’s uniform doesn’t fit, can I return it and get a new size? No, uniforms are ordered based on the information you enter when registering. Once uniforms are order there are no returns or exchanges. If you are unsure about what size your child may wear, please attend one of our try-on sessions. I have a child that plays for MCYFA will my cheerleader be able to cheer for their team? Yes, cheerleaders with siblings playing football will always be placed on the corresponding cheer squad. Unless, otherwise requested. Can I request that my child be on a certain squad or cheer with a friend? Yes, on the registration form please indicate any requests. You will notice there is a section on the registration form for you to include this information. We cannot guarantee your child will be placed on the requested squad, but we will do our best to accommodate all requests. When will practice start and when will my child’s coach contact me? Your child’s coach will contact you around the end of JULY to the beginning of AUGUST before individual squads begin practice. Individual squads should start practicing sometime in the beginning of AUGUST. Practices normally take place at one of the Mentor Public Schools middle or elementary schools. You will receive additional information from your coach before practice begins. When are games and when is the schedule posted? All regular season games normally take place on either Saturday or Sunday. GLYFL makes the schedule and it is usually posted around the first week of August. The schedule should stay consistent once posted, with the exception of unforeseeable circumstances, such as weather and field condition. Does MCYCA do any fundraising? Yes, all cheerleaders are required to participate in selling ten pick three lottery raffle tickets. What does the registration fee cover? What does the money raised in the fundraiser cover? The $55 registration is used to cover league operating expenses. These expenses include, but are not limited to, insurance, background checks, webpage administration fees, first aid kits, training, printing, and other necessary league expenses. The money earned from the annual fundraiser goes right back to the cheerleaders. This money is used to provide for our league year end celebration. The money from the fundraiser provides funds for the location, food, and gifts. Is MCYCA a nonprofit organization? Yes, MCYCA is a registered 501c3. We are registered with the state of Ohio as well as with the Federal government. Our executive board members and coaches are all volunteers. To recieve the $10 family discount for both cheer and football siblings you must send us an email BEFORE REGISTERING at MCYCAcheer@gmail.com. Discounts will NOT be taken off automatically when registering. In 2019 we will still be offering a $10 family discount for both cheer and football sibliings. Payment plans will be offered this year. There are three divisions for football. The "A" division for football is ages 10-11, "B" division is 8-9, and "C" is 6 1/2-7 . Cheerleading is open to ALL children entering Kindergarten thru 6th grade. For CHEER it does NOT matter which division you choose. We will not being assigning coaches until football determines the number of teams they will have per division. Cheerleaders will be placed on squads around the same time football does their draft. * If your child cheered last year, what coach/squad? Would they like to return to the same coach if possible? * Are there any friends your child would like to cheer with? * Does your child have a sibling on cheer or football? Although we can not guarantee requests, our goal is to try and place all cheerleaders on the squad they request. © 2001 - 2019 Mentor Cardinal Youth Cheerleading Association. All Rights Reserved.